Take off this summer with our Sky High Science issue! 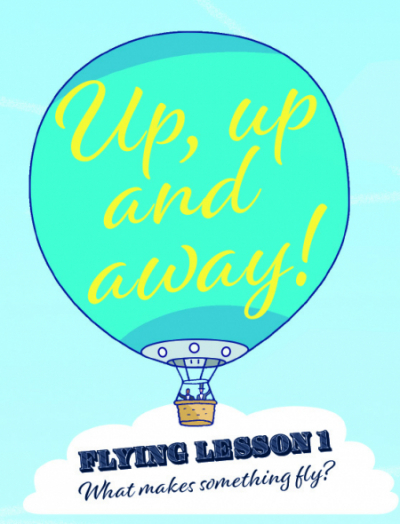 Posted on 2nd July 2018 | by Rachael Tapping | Leave a Comment on Take off this summer with our Sky High Science issue! Wouldn’t it be amazing to fly like a bird? Or how do you fancy fluttering like a butterfly, or even soaring like a snake?! There are all sorts of flying phenomena to discover this issue. Have a go at making your own stunt plane, investigating different designs of straw planes and testing aerofoils. We interview Palaeontologist Liz Martin-Silverstone to ask her how on earth the giant pterosaurs were able to fly, plus we find out how drones work, and answer the question on lots of people’s minds… just how do planes fly??? 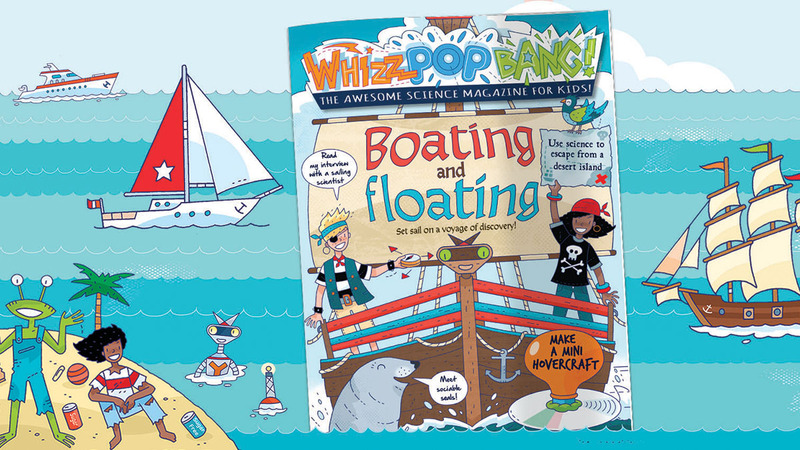 Buy this issue here and fill your summer holidays with awesome science fun!! ? ✈ ? 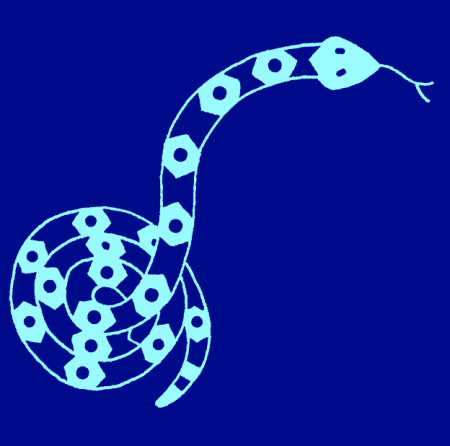 Posted on 19th June 2018 | by Rachael Tapping | Leave a Comment on Flying snake! After launching themselves from a branch, paradise tree snakes flatten their bodies into a wing shape and ‘snake’ through the air, gliding between trees up to 30 metres apart! Mini scientist Poppy explains how to play the virtual breeding game in the Purr-fect pets issue of Whizz Pop Bang science magazine. 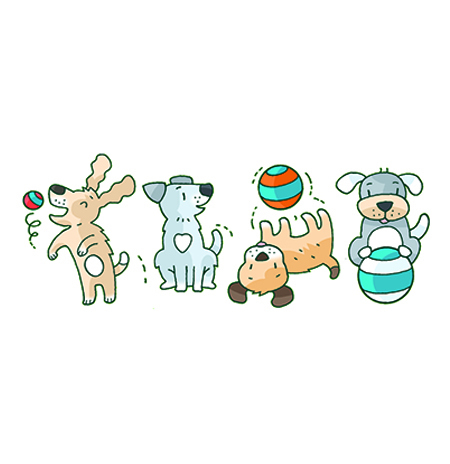 Experiment with breeding different dogs together and see what colour the puppies are! Each dog has two copies of the coat colour gene. The black coat gene (B) is dominant and the brown coat gene (b) is recessive. This means that only puppies with bb genes will be brown, and all those with one or two B genes will be black. Even though Daisy and Max are black, they can still produce brown puppies together, but Buddy and Bella will never produce brown puppies, even if they’re bred with a brown dog. Only Molly with Rocky will produce all brown puppies. Brown puppies are rarer than black so they cost more. This is why pet breeders often breed closely related animals with rare features together. To play this game, buy the Purr-fect Pets issue of Whizz Pop Bang magazine from our online shop for just £3.75 with free UK delivery. You can watch The Royal Institution Christmas lectures on BBC Four at 8.00pm on 26th, 27th and 28th December. Watch The Royal Institution Christmas lectures on BBC Four at 8.00pm on 26th, 27th and 28th December – let us know what you learnt from Sophie! 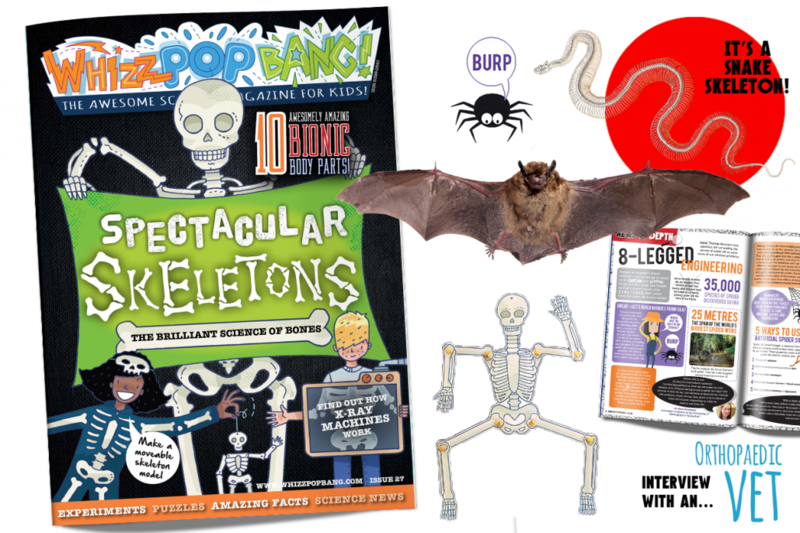 The Whizz Pop Bang Halloween issue is out! 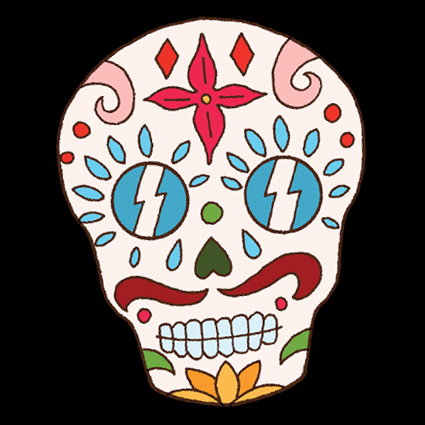 Posted on 2nd October 2017 | by Rachael Tapping | 1 Comment on The Whizz Pop Bang Halloween issue is out! The brilliant science of bones. Did you know that, weight for weight, bone is stronger than steel? Yes, your skeleton is made up of some spookily awesome stuff! Get stuck straight into the bare bones of this issue by crafting a scary skull mask, experimenting with some brilliant bendy bones and building your own model skeleton. Buy this issue here and get crafting some seriously spooky stuff ready for Halloween ? Activities included in this issue: make a ball and socket joint, bend a real bone, make a bendy back bone, make a moveable skeleton, craft an x-ray machine and make a Halloween skull mask. Loads of awesome science fun for kids! Love science books? We’re giving our readers the chance to win brand new hot off the press awesome science books, cool hey?! 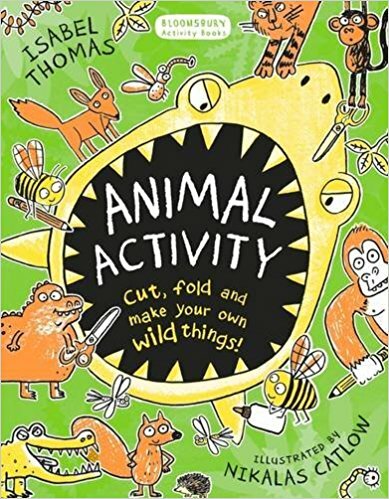 And who better to kick start these monthly competitions than the awesome science writer Isabel Thomas with two signed copies of her new book Animal Activities, ROAR! 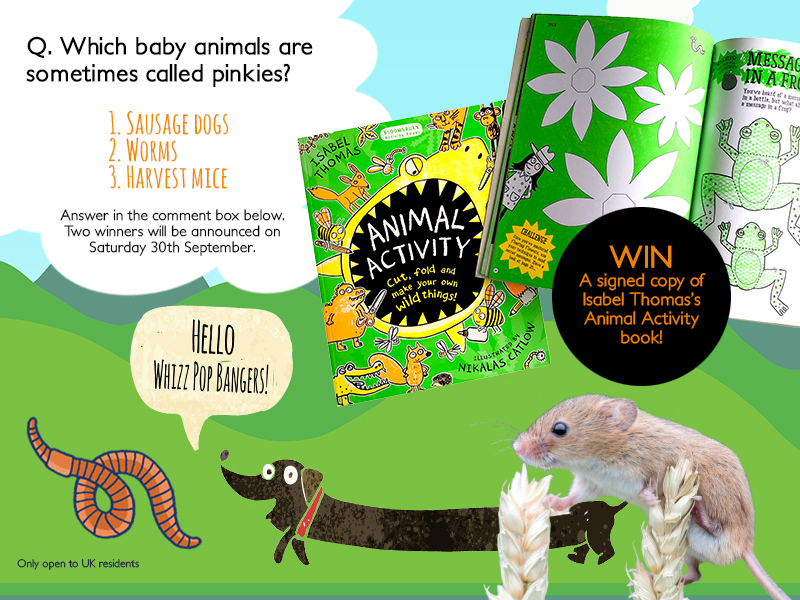 To enter simply answer the question ‘Which baby animals are sometimes called pinkies? Sausage dogs, worms or harvest mice? Leave your answer in the comment box below. Winners will be announced on Saturday 30th September. In this issue we go mad for conkers and pine cones with fun hands-on science activities to learn all about how seeds spread. 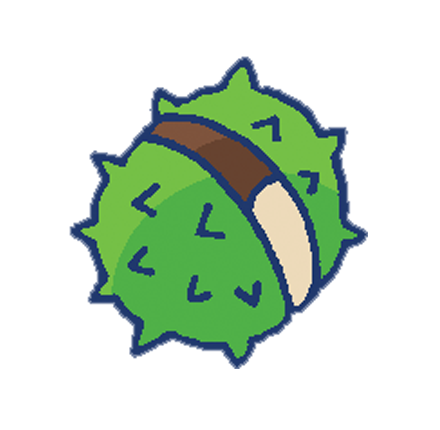 Everyone wants a bit of distance from their parents from time to time, but since seeds can’t move, they instead rely on cunning techniques to find their own patch of ground. Imagine being fired away from your parent in a green slimy liquid! Yes, this issue we’re looking at seed dispersal – you can try modelling dandelion seeds, making your own pinecone bird feeders and experimenting with a sycamore seed heli-spinner. Find out about the history of the invention of Velcro, which was inspired by nature’s own burs and take a peek inside a top-secret seed bank buried deep inside an arctic mountain. Happy experimenting kids! Not a subscriber? Click here to start a monthly subscription from just £2.92 a month with FREE Uk delivery. 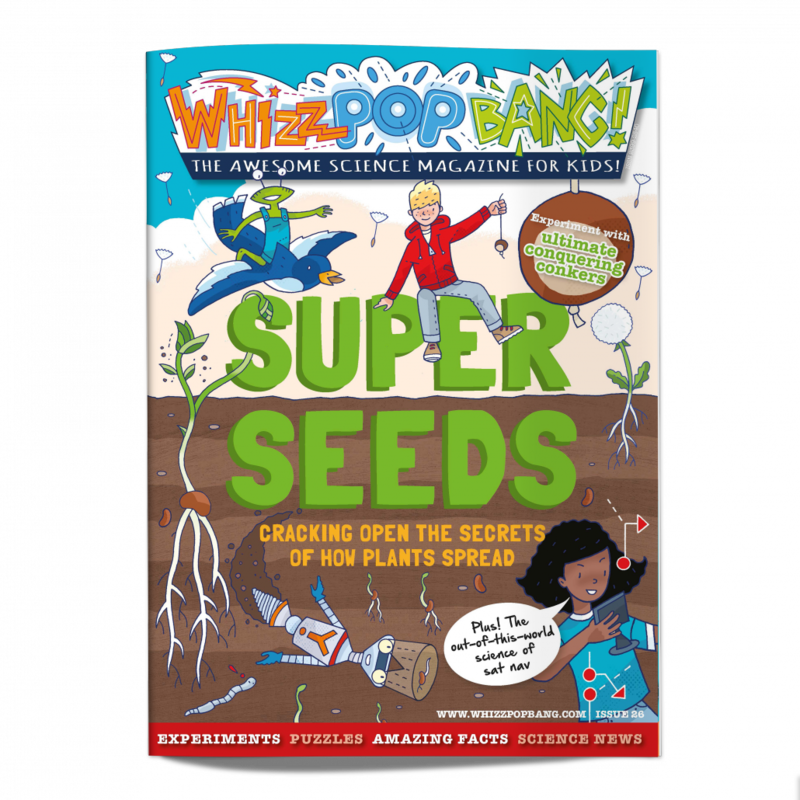 Buy this SUPER SEEDS single issue in our online shop packed full of all our super science magazines and bundles!